:sigh: ok let's start from the beginning my name is Jason Wolf. But everyone just calls me scar. You’ll see why later. This is my story and how I ended up here basically dead. Line 2Well isn’t he a bundle of joy. Don’t worry friends/guys it won’t be that bad… I hope. hello and welcome to United Nations space command unified combined military boot camp Sierra Largo. first off I'll start by saying most of you won't make it to the end of this camp…(long pause as recruits glance at each other) (sarcasm) now for those who do well I hope you move on to have an amazing military career just like mine. Anyway, for those who think they can do this no problem (short pause) well (short pause) let’s just say that you are going to have a much harder time here than most people. Ok so now we’ve got the welcomes out of the way let’s get to the real stuff. Welcome recruits to your new home, I am First lieutenant David Liam and this is ucmb seria largo, where over the next four years you'll become hardened badasses like me, only not as handsome, or respected. sir yes sir!, ok dickheads you heard the captain. Let's move! Yes sir, I will but first you might want to look outside. alright ladies let's take this slow you lose that helmet you’re down in 3, dead in 5, make a bad step and you’ll get a real nice view, and for the love of god no dancing you dont wanna end up like Mexico. When that door opens go straight to the airlock and take the first door on the right not the left That's for later. Physical Description: Warm golden-honey amber eyes and brown hair with an olive skin tone. 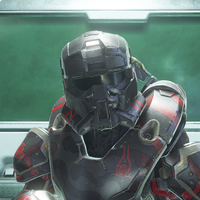 She is more muscled than most women, being a former ODST and now spartan with augmentations. She has a few scars, one across her eyebrow, her lip and cheekbone from fights. She is quick on her feet and usually prefers overseeing an area. Flexible and slim despite her musculature, she can fit into tight spots and can easily get to places most others find difficult to get to. She has complete control over her own musculature and can remain in one position for hours due to her stamina. Personality: Even though Izabelle is not much of a talker, she seems to have no issues with speaking her mind and stating things how they are. She doesn’t sugar coat anything and seems to lack emotion sometimes. She has never been known to beat around the bush, but goes straight to the point. She prefers the high grounds, staying out of sight. If you are unable to find her, check a tree or ledge, you’ll usually find her there if you lose sight of her. She has a knack for fighting into tight places or climbing up to difficult areas. She is curious and this faults her sometimes as she has been caught in a restricted area, once. She knows when she is being lied to, the situation would depend on weather she voices this or not. She seems to work better with those who tell the truth more then they lie. Izabelle does seem to understand and accept white lies, it seems. Previously, she had been a jokester and more easy going, but through bootcamp and strict commanding officers and helpful teammates, it changed for the better. If you would call it that. Bio: Having grown up in the outer colonies with her older brother, Izabelle had been a bit of a troublemaker and used to lie and argue with just about everyone, using her looks to get what she wanted, which was mainly attention. Her brother was often away with the insurrectionist. He agreed with some of the things they did, but not with everything. He did his best to raise her, as their parents had died on Harvest with the glassing of the planet, and tried to teach her right from wrong. She hadn’t exactly been the nicest child and would often thieve little items or food from stores and farmers. She never took much, though, and not many complained because of such things, as most of the stolen items were returned within a few days with nothing wrong. The food was never returned, though, presumed eaten by her and her brother, but farmers that she had taken from would find small gifts left on their farms as a thanks and apology. The gifts usually added up to the general amount of what had been taken. Upon the age of 18, she joined the UNSC after the death of her brother due to his choice in leaving the insurrection. She trained and fought with them before she took to ODST training. She spent the next several years with them before she was offered for the Spartan IV program. At first she didn’t accept, but after a few encouragements from her teammates, she accepted and went into training to become a spartan.